Bradley Wilson-Dean contributed 14 points to Panthers' cause at Ipswich. 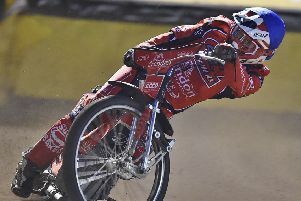 The Peterborough Panthers juggernaut came shuddering to a painful and pitiful halt last night (April 15). The city racers slumped to a first defeat of the 2017 season when being walloped 60-32 by East Anglian rivals Ipswich in the first of two Easter derby clashes between the teams in the SGB Championship. Jack Holder scored 10 for Panthers at Ipswich. Panthers rolled into Foxhall Stadium already without one rider (illness victim Kenneth Hansen) and departed with two others (captain Ulrich Ostergaard and classy winter recruit Paul Starke) on the casualty list. Starke suffered a shoulder injury in an awkward tumble in the initial staging of heat four when taking evasive action to avoid partner Tom Bacon, who had already gone down. Starke did complete the re-run of that race in a distant third place, but took no further part on the advice of track paramedics. And skipper Ostergaard was also forced into an early exit after a nasty heat 10 incident. The Dane lost control and partner Bradley Wilson-Dean could not avoid a pile-up that left both men on the deck. Panthers' star Paul Starke suffered a shoulder injury at Ipswich. The vast majority of Panthers riders looked ill at ease on a tight, but seemingly very grippy, track. Even star-of-the-show Wilson-Dean made no secret of his dislike of the conditions when giving an interview over the tannoy seconds after completing a quick double in heats two and three. The New Zealand champion was Panthers’ only race-winner as he took the flag three times in a hectic, and heroic, seven-ride shift. His 14+1 haul provided almost half of the visitors’ total points and he was the only member of their team to emerge with any real credit. Number one Jack Holder did also contribute 10 points, although he failed to win any of his five races and did see his tally boosted by a double-points outing in heat 11. But the four other team members managed just eight points between them with Simon Lambert failing to score in what can only be described as one of the worst nights of his long career. “We knew we were going to slip up sooner or later,” admitted Panthers team boss Carl Johnson. “But we certainly didn’t want it to be a scoreline like this and to lose two riders in the process. “Paul and Ulrich have both been flying so far this season so to see them both crash out on the same night is hugely disappointing. “There’s no getting away from the fact it’s a bad night, but we’re determined to put it right on Monday (April 17) when Ipswich come to the East of England Showground. “We’re not going to beat ourselves up about one defeat and we’re not going to start pointing the finger at individuals. “We win, lose and draw together as a team, and the track certainly didn’t help us. It was a close contest early on as a 4-2 for the hosts in the opening race was cancelled out by a Panthers reply in heat three when Wilson-Dean claimed the second of his early victories. Skipper Ostergaard looked like following home his partner for a 5-1 for much of that race before succumbing to Witches man Cameron Heeps on the final lap and having to settle for third. That 4-2 was Panthers’ only advantage of the entire night and they soon found themselves cast a drift by a series of five 5-1s from Ipswich in the space of seven races. Starke and Ostergaard both bowed out of the meeting during that run which meant the meeting was all but over by the time Holder was deployed on a tactical ride in heat 11. His second spot earned a 4-4 and another shared race swiftly followed as Wilson-Dean signed off with victory to complete a memorable personal evening. But Panthers couldn’t prevent the hosts from delivering a powerful finish with advantages in the final three races. Two of them featured Tom Bacon who, like Wilson-Dean, took seven rides in all. The reserve was Panthers’ sole representative in the penultimate contest - when riding smartly for a pleasing second place - and then found himself thrust into the finale only to suffer a retirement. It was an experience that will do him good, but one that the majority of Panthers’ riders, bosses and fans would like to forget pretty quickly. They’ll hope that a return clash at the East of England Showground tomorrow, 3pm, follows a rather different script. But with Hansen again missing, and Starke and Ostergaard both described as ‘doubtful’ last night, that is far from assured. IPSWICH: Cameron Heeps 12+2, Rory Schlein 12+1, Danny King 12, Danyon Hume 11, Nico Covatti 6+2, James Sarjeant 4+2, Connor Mountain 3+1. PANTHERS: Bradley Wilson-Dean 14+1, Jack Holder 10, Ulrich Ostergaard 4+1 (withdrawn), Tom Bacon 3, Paul Starke 1 (withdrawn), Simon Lambert 0, Rider replacement for Kenneth Hansen. 1 – re-run King (55.8), Holder, Hume, Lambert. 4-2, 4-2. 2 - Wilson-Dean (57.8), Hume, Mountain, Bacon (fell). 3-3, 7-5. 3 - re-run Wilson-Dean (57.8), Heeps, Ostergaard, Covatti. 2-4, 9-9. 4 - re-run Hume (58.8), Schlein, Starke, Bacon (fell/exc). 5-1, 14-10. 5 - Covatti (57.7), Heeps, Holder, Lambert (ret). 5-1, 19-11. 6 - King (awarded), Wilson-Dean, Ostergaard, Sarjeant (fell/exc). 3-3, 22-14. 7 – re-run Schlein (58.1), Ostergaard, Wilson-Dean, Mountain (fell/rem). 3-3, 25-17. 8 - Hume (59.3), Sarjeant, Bacon, Lambert (ret). 5-1, 30-18. 9 - Heeps (58.2), Covatti, Wilson-Dean, Bacon. 5-1, 35-19. 10 - rerun King (57.3), Sarjeant, Wilson-Dean, Ostergaard (fell/exc). 5-1, 40-20. 11 - Schlein (57.5), Holder (t/r), Mountain, Lambert. 4-4, 44-24. 12 - Wilson-Dean (58.5), Hume, Covatti, Bacon. 3-3, 47-27. 13 - King (56.8), Holder, Schlein, Lambert. 4-2, 51-29. 14 - Heeps (58.1), Bacon, Mountain. 4-2, 55-31. 15 - Schlein (57.1), Heeps, Holder, Bacon (ret). 5-1, 60-32.